You are currently browsing articles tagged andrew charlton-perez. Weather forecasters face storm of criticism – so is it time for a new look? Former BBC weather forecaster Bill Giles’ criticism of weather forecasts raises questions about how weather is communicated generally. Mr Giles has hit out at forecasters for regularly warning the public about the potential consequences of imminent severe weather, arguing they are ‘behaving like nannies’ and could cause the public to become ‘immune’ to the advice. 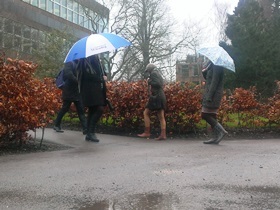 Rain in Reading – watch out for that puddle! He added the practice of naming storms had become too frequent, and that forecasters should only advise people about potential dangers for ‘exceptionally severe weather’, which occurs once every few years. But how much weather information is the right amount for the public? How much do they understand? Could an appreciation of the uncertainty of forecasts actually improve our faith in them? Research at the University of Reading has shown that not only is the average person able to process more complex weather forecast information, they are likely to make better decisions as a result of the additional information. Scientists at Reading have therefore begun looking at whether the way weather predictions are presented to the general public can be improved.